The Nevada State Parks Passport booklet can be picked up at any state park. 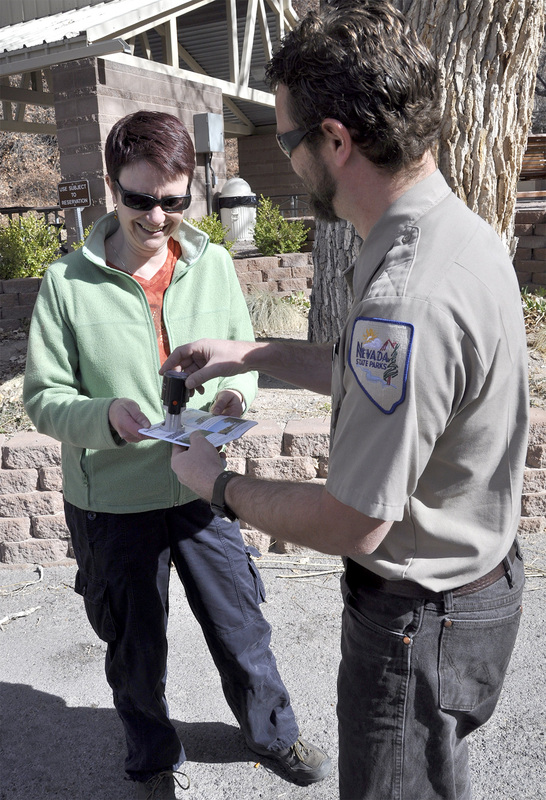 Visitors who have their booklets stamped at 15 different parks will earn a free annual pass to all Nevada State Parks. The booklet serves as a travel aid as well as travelogue for park visitors. It includes photos, a description of each park, a list of each park’s amenities, travel journal pages and spaces for individual park validation stamps, which have been designed to reflect the uniqueness of each state park. The Passport Program was designed to challenge and encourage Nevada residents and visitors to experience the diverse natural, cultural and recreational resources that span all of Nevada's state parks. Q: Where can I get a Nevada State Parks Passport booklet? A: You can pick up a passport booklet at any Nevada state park, the headquarters office in Carson City, region headquarters in Fallon and Las Vegas, or one can be mailed to you by calling (775) 684-2770. Q: Are Passport booklets available at retailers? A: There is no charge for the passport booklet, they’re free! Q: How do I earn a free annual passport permit? A: That’s easy, just visit 15 different Nevada state parks and have your passport booklet stamped while you’re there. Q: How do I get my passport booklet stamped? A: While you’re visiting a Nevada state park, ask a park ranger to stamp your passport booklet on the page of the park you’re visiting. Q: How do I get my passport booklet stamped if park rangers or staff are not available? A: If you experience any difficulty in obtaining your stamp, please call (775) 684-2770 so that we can make sure your visit is recognized. Q: Once I get my passport stamped at 15 different parks, how do I get my annual pass? A: Bring the passport to any park, regional office or the headquarters office in Carson City. Once your passport is checked, you will be issued a pass that allows free admittance to any and all Nevada State Parks for an entire year.